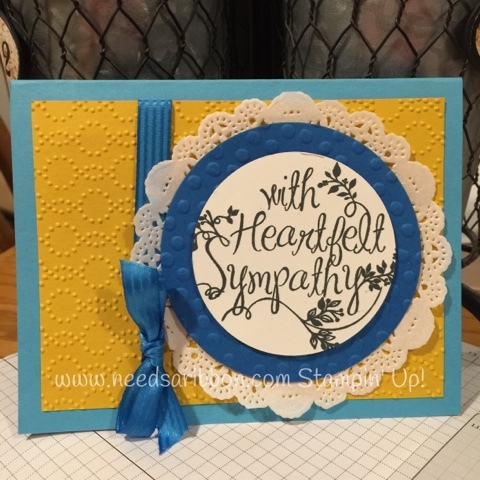 My cousin requested a few specialty sympathy cards a few weeks ago. A young teen lost her fight with Cystic Fibrosis. The requirements were as follows: her favorite color was purple and turquoise for CF association, and she liked butterflies. I tried to incorporate all of that in one card and it just looked like a hot mess. There is no evidence of that first draft left on the planet. I am sure I could if it hadn't been right before Christmas. I decided to break it down into two different cards. My cousin could then choose to use one or both of the cards. 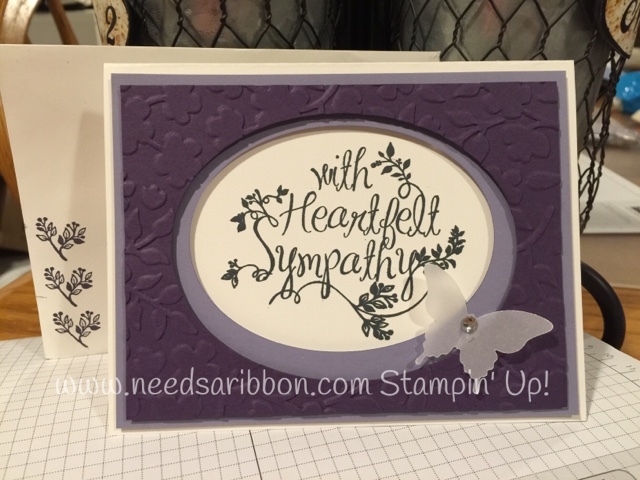 I used the Heartfelt Sympathy stamp set from the Annual Catalog. Since the purple card has such strong colors, I chose to soften the butterfly by cutting it out of vellum. It created a subtle accent to the sympathy focal point. For the Cystic Fibrosis card, I used their colors, yellow, bright blue and turquoise. It is not my favorite color combination but the symbolism of the colors means so much. 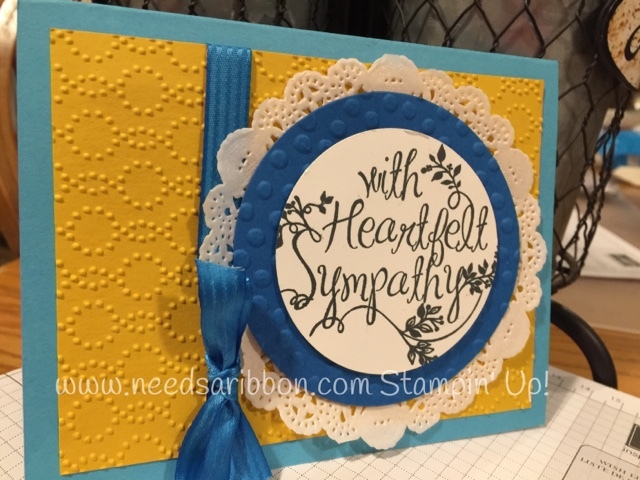 I softened the bold colors with the doily and embossing the yellow in the dotted folder. It was fun to make custom cards. Of course every card I make is custom, but to get a special request I was quite honored! I hope Maddie is at peace now. CF is such a brutal disease. I worked in XRAY in a hospital many years ago, and saw daily the affects it ravaged on young people. My heart goes out to everyone affected by CF.